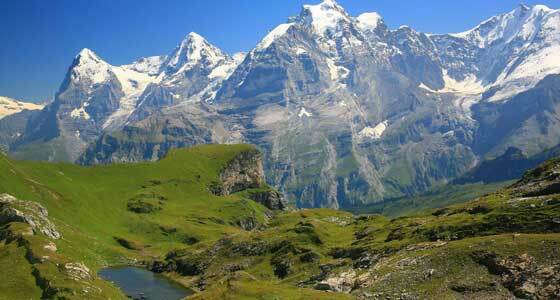 The Swiss Alps, or Central Alps, represent just a small portion of the entire Alps range, however it is home to Europe’s greatest concentration of 4000m mountains. Often we think of stereotypes when talking about hiking in Switzerland: alpine pastures, contented cows grazing lush grass, wooden chalets and snow-capped mountains. 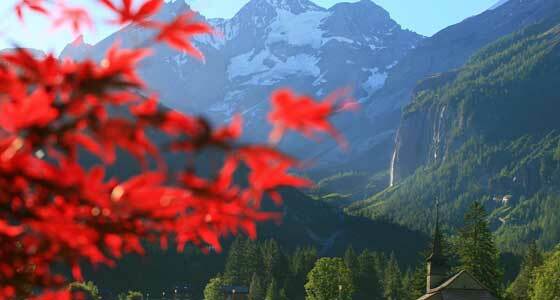 Although there is much truth in this narrow view, it does little justice to the spectacular variety of terrain that Switzerland is able to offer the active traveller. 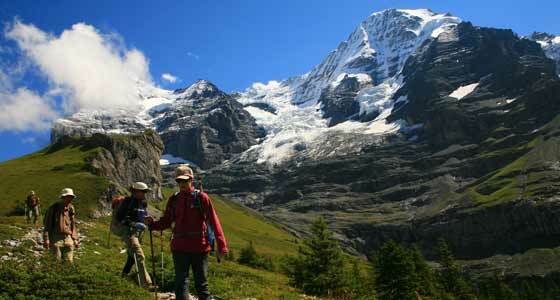 Swiss mountains are among the most dramatic and challenging of all the Alpine ranges however you don’t have to be a skilled mountaineer or climber to enjoy walking holidays in Switzerland. 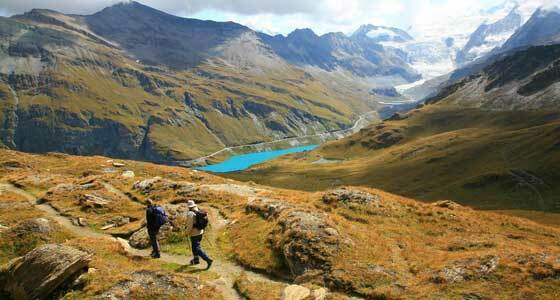 The Swiss Alps is home to some of Europe’s finest walking terrain, with enough variety to suit every taste and fitness level. 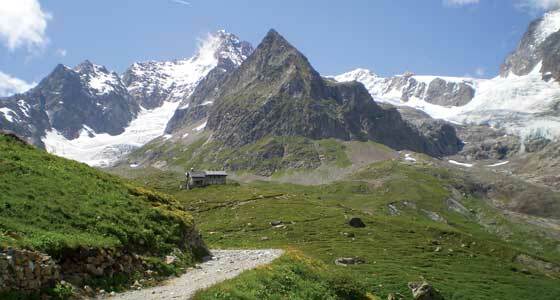 Rustic inns and a network of alpine or mountain huts (hütte; refuge; rifugio, cabane or capanna) provide simple dormitory accommodation, generally with meals too. 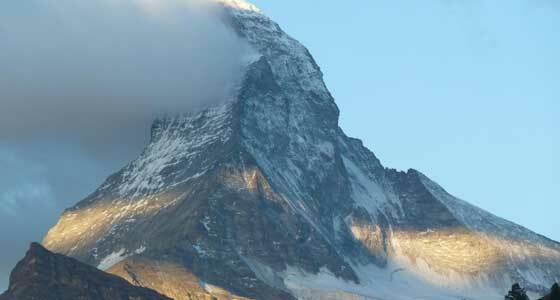 Our range of self-guided or guided walking holidays in Switzerland will help you come face to face with the most famous names in the Alps including the Matterhorn, Jungfrau, the Wetterhorn, Eiger and much more. 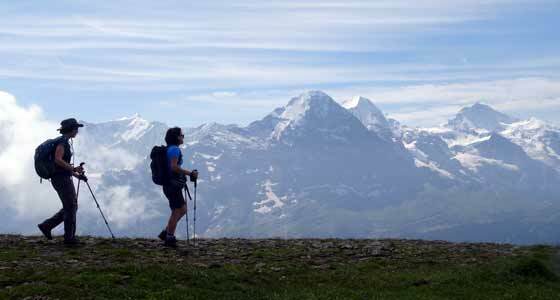 The season for walking holidays in Switzerland is short – from mid-June to mid-September and many of the mountain refuges are closed outside this time. In winter, parts of the hiking trails are transformed into world class ski runs, evidenced by the comprehensive network of cablecars or téléfériques. Bearing in mind that much of the route is at altitudes of over 1000m, the temperatures can vary significantly. Please note at the beginning of the season you may experience snow and therefore the walking can be harder with slippery underfoot. Temperatures in the European summer range from around 6 degrees Celsius to 20 degrees Celsius during the day. Afternoon thunderstorms are quite common and at the higher elevations it is important to dress with layers as cold winds and possible snowfalls can happen even when you are hiking in summer. As you would expect, Switzerland is served by a number of airlines (low cost and otherwise), trains and buses from a multitude of European and international destinations. Depending on the region you are planning to go for your Swiss hike, we recommend heading to Geneva, Basil or Zurich, where you will find onward local connections. Switzerland has one of the most comprehensive and scenic public transport systems in the world, making it an ideal place for a hiking holiday. While transport is fairly pricey, there are a number of discount cards for getting half price deals on Swiss rail, post buses and cable cars, do ask your travel advisor for details on this.